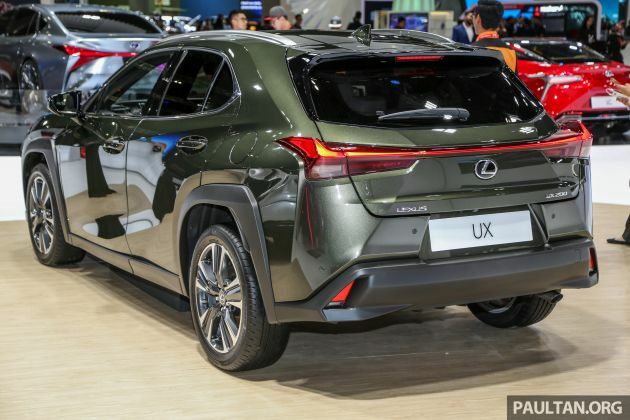 Another debutant at the Kuala Lumpur International Motor Show (KLIMS) is the Lexus UX, the Japanese luxury carmaker’s smallest crossover. This left-hand drive unit serves as a preview ahead of a proper launch sometime in the near future. Shown here in UX 200 guise, the new vehicle is poised to take on the likes of the BMW X1 and Mercedes-Benz GLA, and has an extroverted design to match. The typical Lexus spindle grille is flanked by sharp headlights with arrow-shaped LED daytime running lights, while the side features prominent fender bulges, squared-off wheel arches and a low-slung roofline. Full-width LED tail lights complete the look. 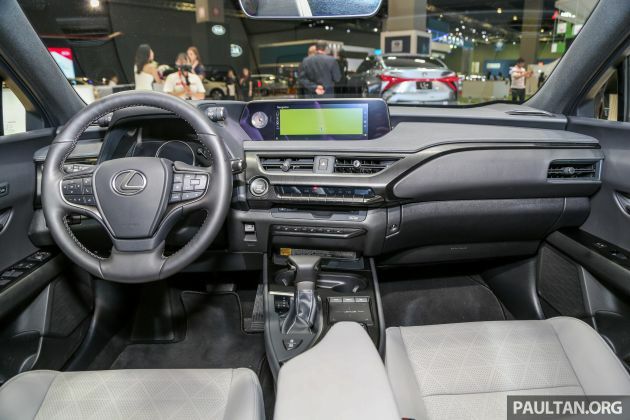 Inside, the UX takes after other recent Lexus models like the LS and ES, with a sweeping dashboard design and a freestanding centre display measuring up to 10.25 inches, controlled by the Remote Touch interface. Stylistic touches derived from Japanese culture include sashiko leather quilting and decorative trim inspired by washi paper, while the air vent control knobs feature wireless lighting with an infinite reflective effect. 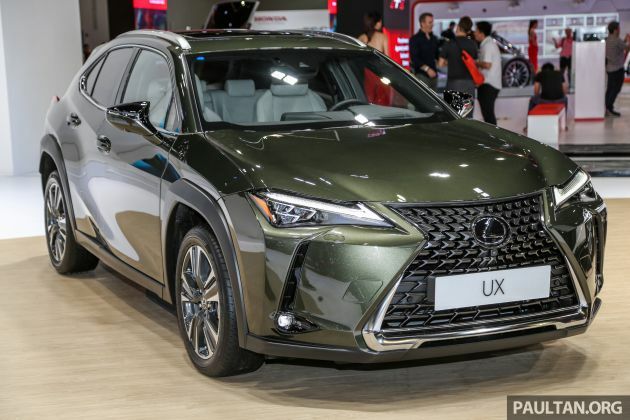 The UX is 4,496 mm long and has a 2,639 mm wheelbase, which makes it 144 mm shorter than the NX, although the wheelbase deficit is just 21 mm. It rides on the Global Architecture – Compact (GA-C) platform, Lexus’ version of the Toyota New Global Architecture (TNGA) that also underpins the C-HR. This platform provides the UX with a low centre of gravity, supported by the use of aluminium in the doors, fenders and bonnet, as well as a resin tailgate. Suspension is handled by MacPherson struts at the front and double wishbones at the rear, with column-mounted electric power steering assistance. Powering this UX 200 is a 2.0 litre Dynamic Force naturally-aspirated and direct-injected four-cylinder petrol engine, making 169 hp and 205 Nm of torque and paired to a 10-speed Direct Shift automatic transmission. Also available is a UX 250h hybrid that pairs this engine to an electric motor to produce a total system output of 181 hp, with another motor at the rear providing all-wheel drive. Safety-wise, the UX is available with the Lexus Safety System+ suite of driver assists, including Pre-Collision System autonomous emergency braking, Dynamic Radar Cruise Control with Lane Tracing Assist (LTA) that allows the car to accelerate, brake and stay in its own lane semi-autonomously, Adaptive High Beam System (AHS), Road Sign Assist (RSA) and a Parking Support Brake System. Am I the only one here think that this car is ugly? It don’t looks like LEXUS style at all, for me. Not cool. Why interior looks like a Mazda? Expect this to be a hot seller here BUT volume wise it will never beat the likes of BMW or Mercedes because it will only come in CBU form and I won’t be surprised if it’s more expensive than the XC40. Forgot to add it doesn’t even come with a turbo charged engine so it’s all show and no go for this SAV. Right. Turbo wise, go for Harrier 2.0T 240hp. Expect the price no less than rm250k. Myb same price as toyota harrier. So better get harrier lah. You’ll better beat the Audi Q3.